One thing you’ll notice is that all of the best podcasts go past the call of simply having downloads through iTunes. They generally have beautiful websites with links to all of the podcast episodes. What’s the point of having a website for your podcast? To start, it opens up possibilities for advertisements. In addition, you can stream shows directly to the site. We also enjoy that podcast websites have the functionality for uploading images, sharing videos, selling products and creating a brand for your show. 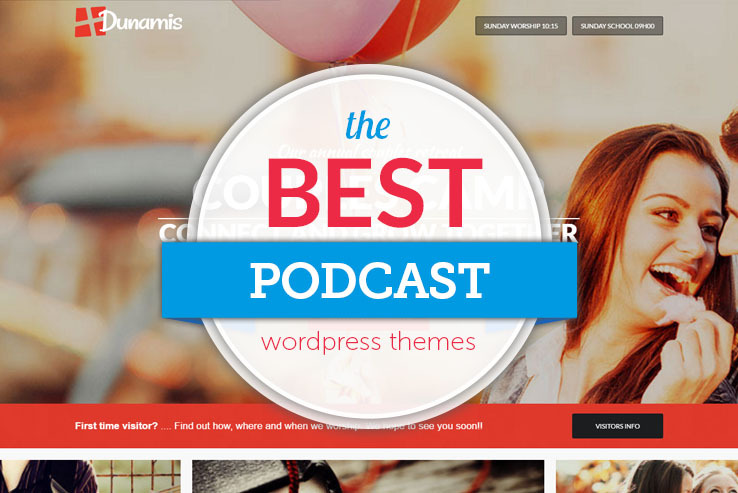 Regardless of the type of podcast you plan on making, the key is to start with a WordPress podcast theme. High-quality podcast themes are mainly designed to support lots of audio clips, allowing you to get your shows uploaded quickly, while also giving you plenty of other tools for when you want to expand. Heck, you even receive an option to run your own full-fledged blog to complement the podcasts you share on a regular basis. Overall, the only way you’re bound to build an audience and keep those people coming back for more is to construct a website with a theme. 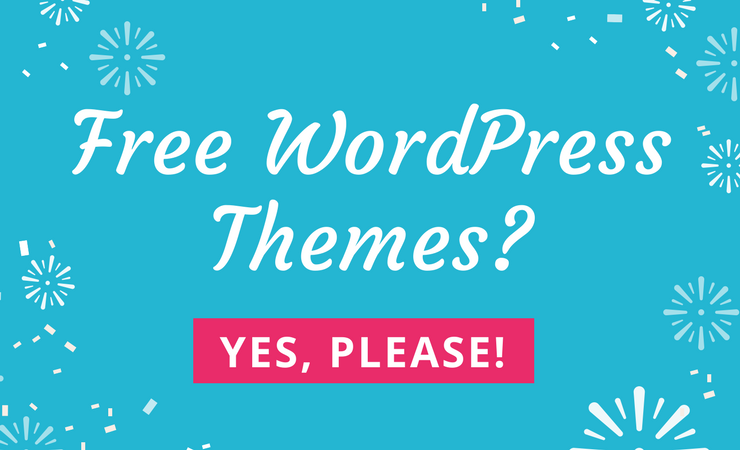 Luckily, the WordPress podcast themes below are of the highest quality and you don’t have to spend much time working on them. Try out the Podcaster WordPress theme if you’re interested in hosting an extreme amount of multimedia on your site. Seeing as how the whole point of this article is to help out podcasters, that’s probably going to be you. However, the Podcaster theme also supports other types of media, so if you’d like to upload videos as well, go for it. As you’ll notice from the sales page, the entire reason this theme was created was for podcasters. You’ll see that the responsive and retina ready design is exactly what you need for displaying your episodes. Because lots of your listeners are going to be riding on the bus to work or working out at the gym trying to listen to your podcast. Sure, they have the option to go to the iTunes store and download it onto their device, but many of the users will prefer bringing up your website and playing it directly from a mobile website interface. Several podcasting plugins work with the theme, allowing you to complete some editing, uploading, and display, all without spending much time. The theme options on the backend are easy to use, while the parallax scrolling is shown in the headers, adding a nice scrolling effect that grabs the attention and shows off your creativity. We talked a little bit about the podcasting plugin compatibility, so the ones that are particularly useful for this theme include BluBrry PowerPress and Seriously Simple Podcasting. 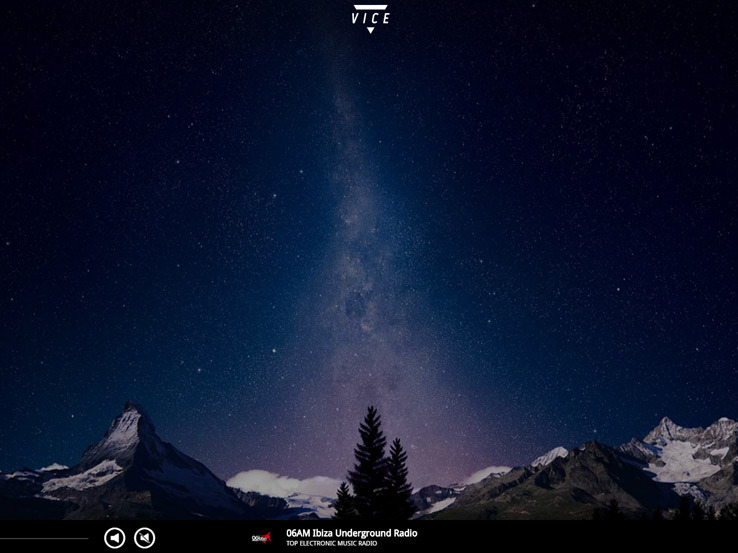 The theme lets users listen to your most recent files right on the front page and it has a spot to upload your own header. Link to your subscription services and display links to your blog if you plan on having one. The sticky header helps with navigation, while various color palettes and typography options improve the way people see your brand. White, yellow and dark shades are provided, and a contact form ensures that people can get in contact with you for any questions they have. 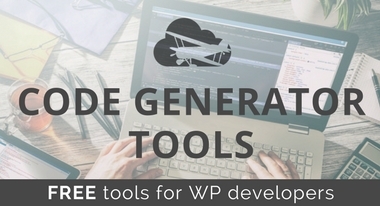 Overall, it’s a fairly simple theme, but you do get all of the branding tools you’ll need. 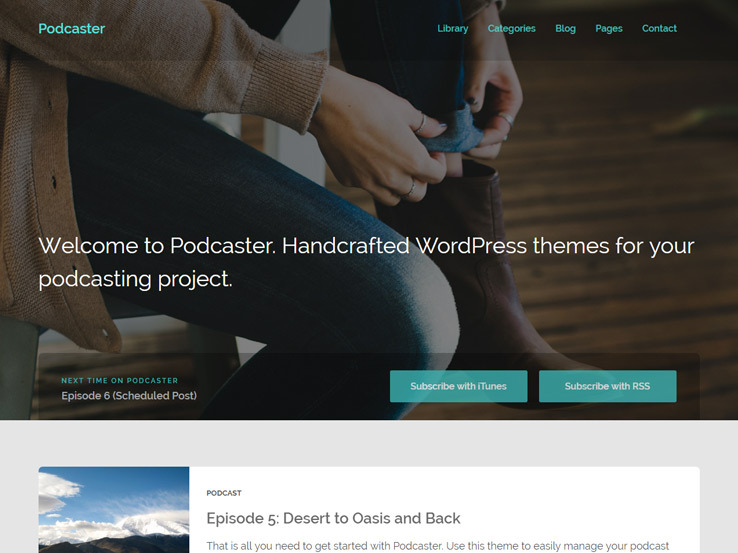 We recommend the Podcaster theme for beginners and intermediates who plan on running their sites themselves because it doesn’t take much knowledge to get things going. Album comes from Press75, giving you a peace of mind since the Press75 support team is pretty darn solid. 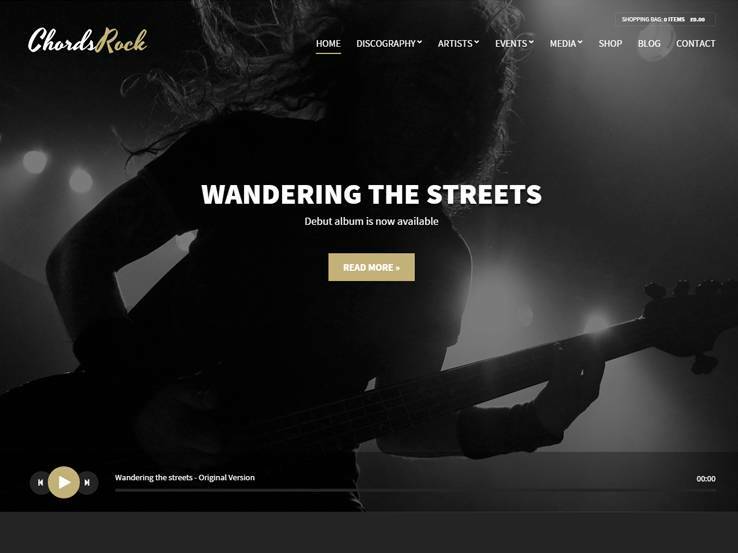 The theme is completely responsive for viewing on mobile devices and it’s built to work well for people who are going to be posting lots of audio clips on the website. Therefore, they suggest that musicians, venues, and record labels give it a try. 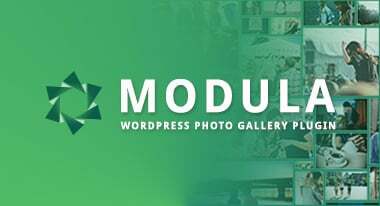 That said, we also think that podcasters will find the Album WordPress theme valuable. The theme includes an integration with the WooCommerce plugin, which is great if you’d like to start selling merchandise or event tickets for when you plan on holding live podcasts. Translation files are included with the theme, making it easier for you to reach out to people who may not speak your language. Uploading audio clips is the main reason you would go with Album, but video support is solid as well. Sample content is provided for those who don’t want to start their design from scratch, while the backend customizer is fairly easy to learn and manage. Several widgets boost the effectiveness of your theme and they turn the backend of your site into somewhat of a drag-and-drop interface. Choose the number of columns you want to have and place advertisements all over your homepage and blog posts. These ad locations are preset so you don’t have to program anything into the code yourself. You can use AdSense or reach out to sponsors who are willing to pay for your efforts. The custom menus improve the way you set up your navigational menu and the social media buttons mean that people can follow you on places like Facebook and Twitter. 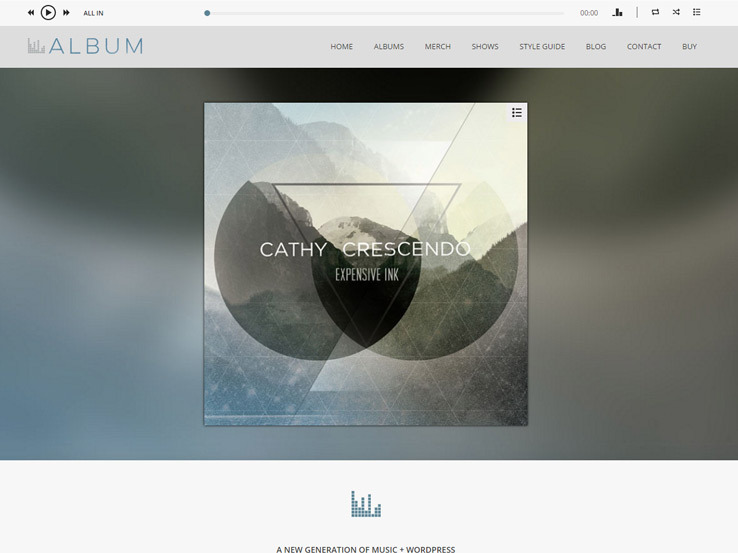 When landing on the Album demo, you’ll see quite a few areas of interest. First of all, the most recent podcast clip sits right at the top of the site. This is above the header so that all of your users know exactly where to go for the most recent podcast. A large header is provided which reveals a list of your entire episode lineup when someone clicks on it. The theme has an Upcoming Show module, but you could easily turn this into a list of the possible topics you plan on talking about in the future. Heck, many podcasts do live shows as well, so you could treat it just like a band would. Merchandise is shown with several images and links on the homepage, while the blog and contact forms are situated on their own pages. 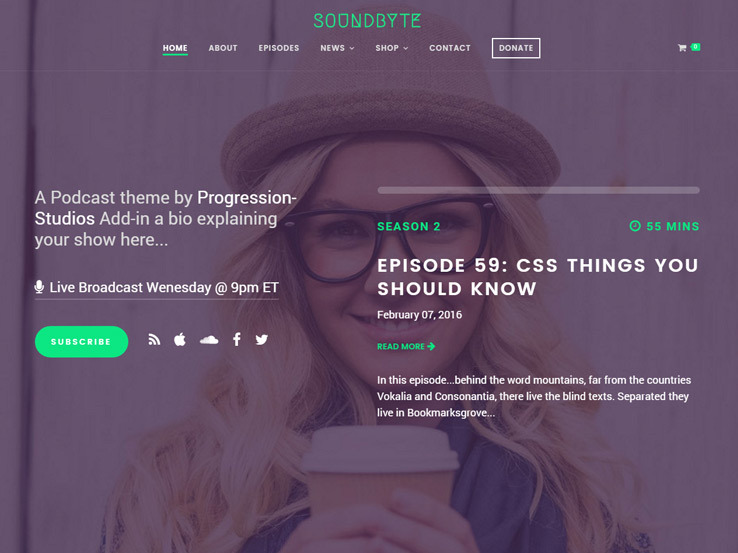 The Soundbyte WordPress theme is a promising take on the podcasting theme, with support for both video and audio posts. The theme has a one-click demo installation, which is not only ideal for beginners but advanced users as well. It’s always nice when you can get the theme installed with seconds and get to the real meat of the job. The audio and video player supports multiple devices, which goes well with the responsive nature of the theme. People can always come to your website knowing that new shows can be listened to through whatever device they have on them. 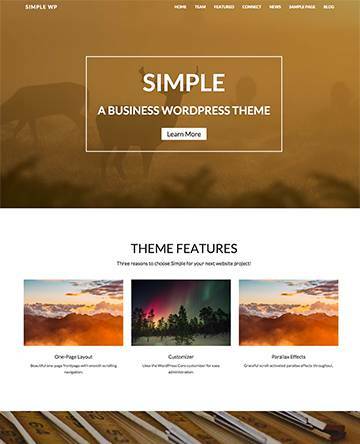 A page builder is provided when you purchase the Soundbyte theme, offering a beautiful drag-and-drop interface. Unlimited colors expand your ability to brand your site even more. Not to mention that it only takes a few moments to adjust the colors to match your logo. The eCommerce support is impressive, which means it’s easy to start selling digital and physical goods. The header is one of our favorite parts of the theme because it shows an insane amount of information about your podcast. Taking up the entire screen, the header has a spot to talk about when your next show is going to be. In addition to that, you can have a button to get people to subscribe, along with a link to the most recent show and a little bit of text that tells users how long that podcast is. A Donate button connects with PayPal to bring in money for your efforts. You can also feature some of your sponsors on a page for maximizing the amount of money that comes in for your podcast. Google Fonts and Google Maps are both included with the theme, assisting people who would like to find an event, while also creating a more beautiful interface for your own website. Users have the ability to browse all of the episodes on your homepage, and they can learn about the show hosts in one of the About modules. Link to your social media pages and upload a picture of you to create a more personal effect. The footer is ready for you to insert a few widgets, but they are simple options, such as categories, latest news, and social media buttons. Overall, it’s not a bad theme for anyone who’s planning on using lots of media. We recommend testing out the demo to see if it’s what you need, and playing around with the audio tools to get an idea of what your users are going to experience. Sessions puts your latest episodes in the center of attention with a slider that’s situated right below the header. Further down the page you can show what’s to come in future episodes and you can even include galleries if you had a live podcast in an interesting location. Feature recent episodes right below that and provide a brief description of your podcast. All the sections and episodes include stylish icons and you can even integrate the shop with the theme and sell some of your podcast episodes. 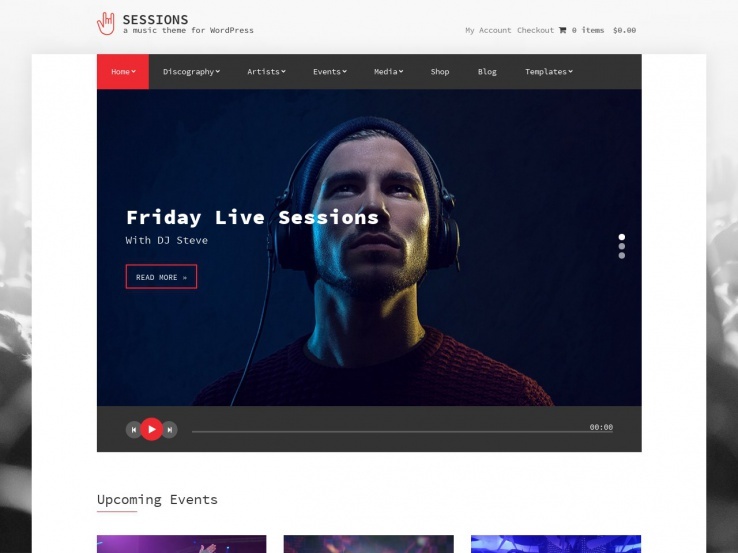 Quite a few page templates are included with the Sessions theme and they have different layout possibilities for the ultimate variety in your design. The theme features a fullscreen background image which is a great starting point when it comes to branding your site. Page layouts can easily be modified with either Divi Builder, Elementor, or Site Origin’s page builder plugin. Upload your logo, insert your Google Analytics tracking code, change colors, set special settings for your various posts, pages, and more with the theme options panel. On top of that, the theme optimized to load fast, is completely responsive, and translation-ready. Vice is a rather impressive theme with a beautiful glass design which is sure to capture the attention of your visitors. Another way to capture the attention is by using a video background. 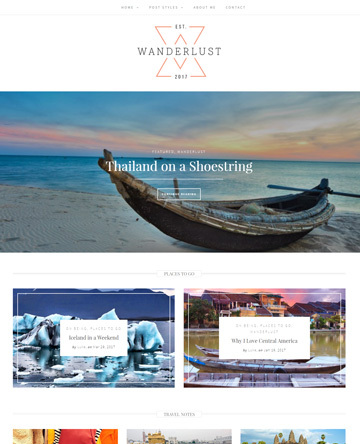 The theme has a minimal menu which has been pushed off to the side, allowing your content to take the main focus. You can feature your latest episodes and give a preview of future ones. The theme also has the ability to showcase events along with a map of the location, in case you’ll be doing a live podcast somewhere. The theme has infinite color possibilities and you can easily change the fonts and upload your own logo as well. Integration with Revolution Slider is provided as well to create stunning slideshows and the advanced music player has all the tools you need to allow visitors to listen to your podcast episodes. On top of that, the theme is fully responsive and ready to be translated into any language. Americanaura is a classy theme with a grid-based layout that features your latest podcast episodes and blog posts. The header area has a stylish space to feature a list of upcoming events and the slider is the perfect place to promote your most recent episodes. You can also upload video posts and several widgets allow you to insert your Twitter and Pinboard feeds. Add social media icons to grow your following on places like Facebook and Twitter and use page templates to easily share videos, albums, and audio posts. The theme is fully responsive which means your audience will be able to access your content even if they are on the go, using their phone or tablet. Customize the theme’s colors and fonts to make it match your brand. 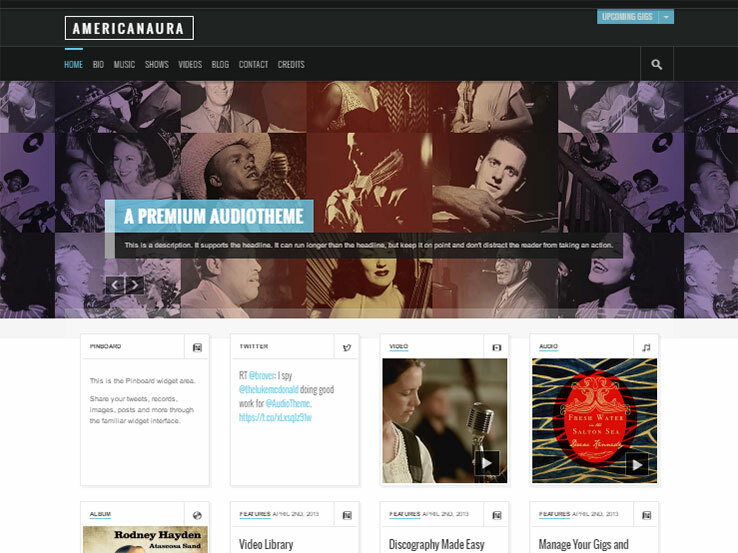 Finally, the theme is built on the AudioTheme framework and it has all the functionality you need to maintain a vibrant web presence so give Americanaura a try. 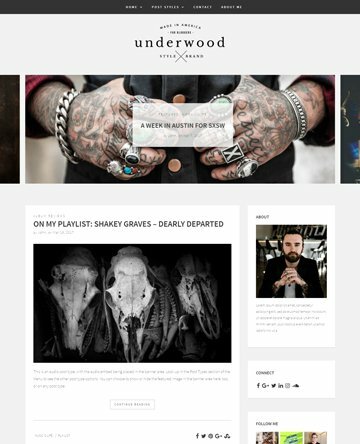 The Chords theme was designed for musicians and artists, making it a great option to build your podcasting website with. It comes with an in-built audio player so listeners will be able to stream your podcasts straight from your front page. You can easily create playlists of your podcasts and embed them anywhere on your site thanks to the intuitive track list module. 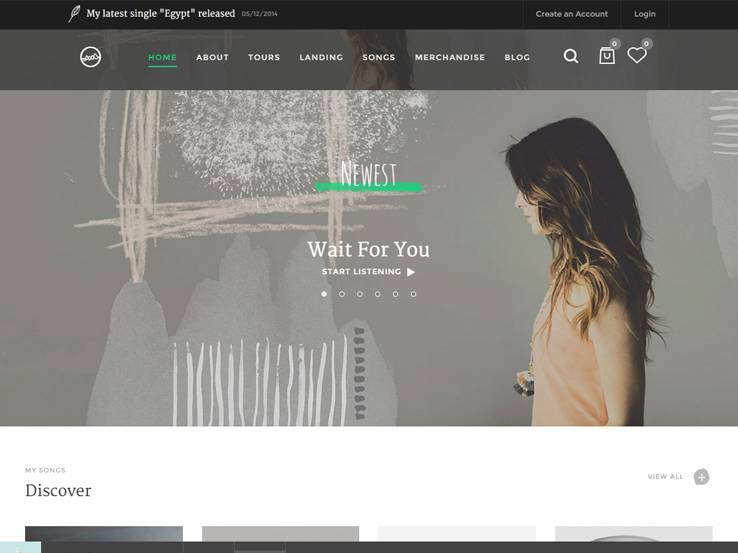 Besides, the Chords theme features a stunning fullscreen front page slider and supports other media types such as videos and galleries. It also provides an in-built events management system, a drag-and-drop page builder, a blog to complement your podcasts, and eCommerce support if you’d like to add an online shop. From CSS Igniter comes Kontrol, a cool WordPress theme with powerful features for launching a reliable podcasting website. It comes with a discography management system that you can use to create podcast lists and embed them anywhere on your site. You can add links to your latest podcast episodes on your sidebar where listeners can easily access them. 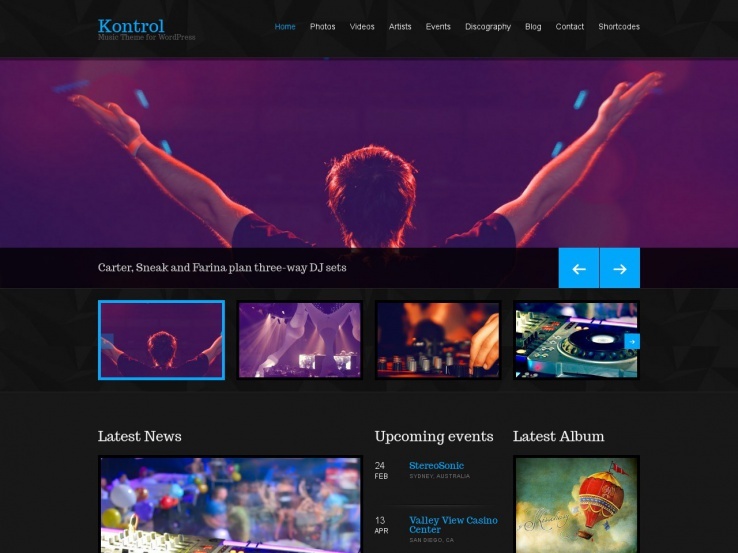 Besides, the Kontrol theme features a stunning front page slider, a stylish blog to accompany your podcasts, and support for other media types such as videos and images. It also includes social media integration and features a subtle Twitter feed for displaying your Twitter activity on your site. 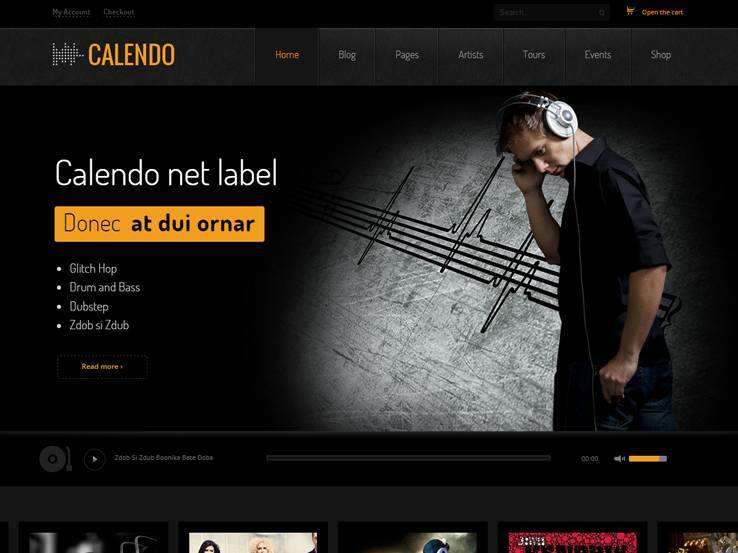 The Calendo theme makes it easy for you to upload your podcasts and let users stream them directly from your site. It comes with an audio player that can be added to the homepage, specialty pages for your podcasts, and amazing carousels for showcasing your podcast episodes. In addition, the template provides video support and includes a beautiful gallery section for showcasing your photos. It also integrates nicely with social media, making it easy for people to follow you and share your podcasts with their friends. You’ll also find an elegant blog, an events module, and eCommerce support. 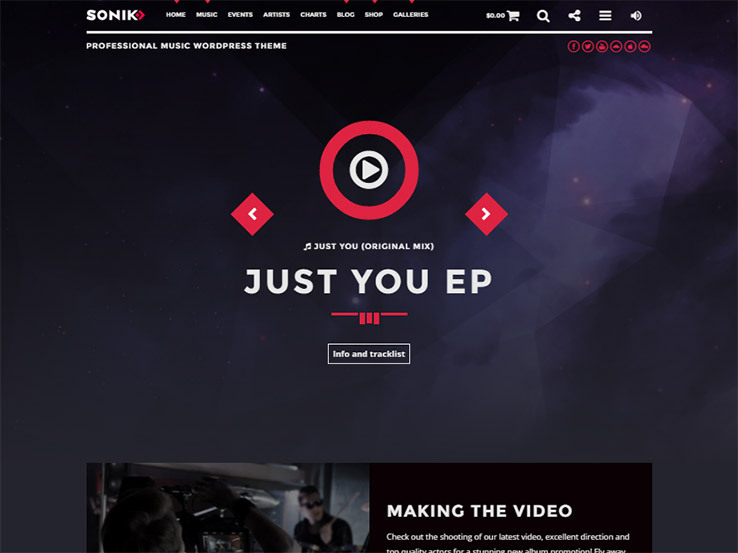 The Sonik theme provides all the tools you’d need to launch a professional podcast website. It comes with a dedicated podcast module that supports Mp3 uploads and Mixcloud and Soundcloud imports. It also includes podcast archives for your podcast collections, a powerful music player so users can listen to your podcasts directly from your site, and eCommerce integration that makes it possible to sell podcasts from your website. 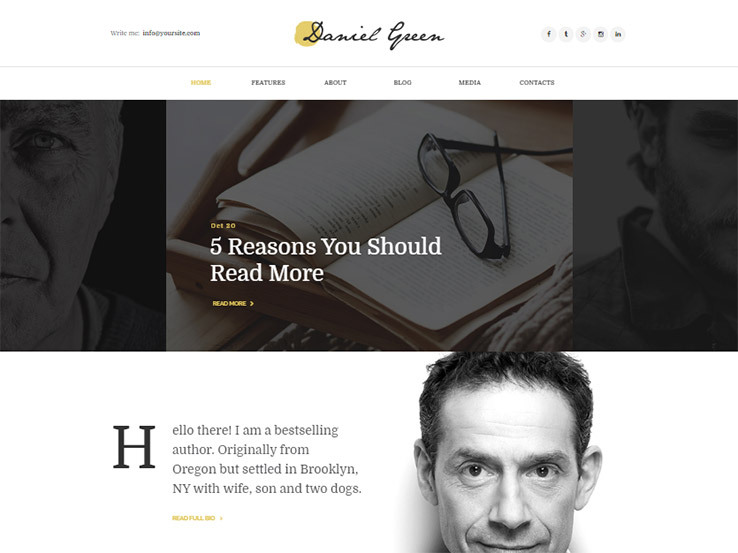 Moreover, this template comes with several home layout styles, a blog to complement your podcasts, and support for other media types like video and images. It also brings custom backgrounds and over 100 customization options, allowing you to easily style your site according to your requirements. If you’re a writer or journalist and would like to add podcasts to your inventory, consider this template. It comes with a professional look and feel and offers a wide array of features including eCommerce support so you can easily sell your podcasts from your site, beautiful sliders that will capture attention immediately users land on your site, and a clean and simple blog to share your knowledge and attract more traffic. Lots of customization options are available so you can easily style your site – you change layouts, colors, fonts, and more. Also, you’ll find social media integration to help increase your reach, an email subscription module for users to stay tuned via email, and video and photo galleries to add variety to your site content. Want the ability to sell your podcasts directly from your website? 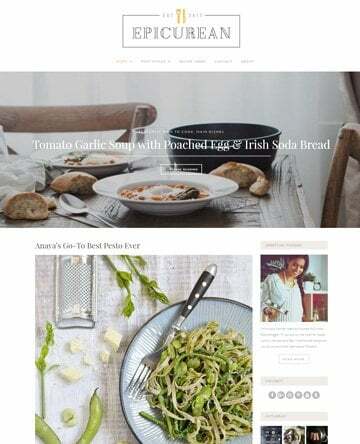 Try the Sura WordPress theme. It comes with eCommerce support, allowing you to setup an online shop for your podcasts in minutes. Besides, users will be able to stream your podcasts right from your site and they can also subscribe to your newsletter and receive your latest releases straight to their email inbox. Additionally, the Sura theme includes social media integration and a blog section to complement your podcasts. It also comes with over 10 pre-made page templates to get you started much quicker, and a drag-and-drop page builder for creating custom page layouts without coding. Hi Denis,\n Thanks for suggesting your theme to our readers. We will be checking it out for a future update. Good luck with your new podcast! 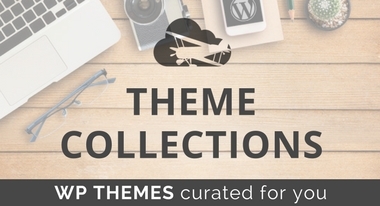 Which theme did you pick?